As the band took to the stage at 1:35 p.m. sharp, an eager fan yelled "I saw you guys 12 hours ago!" Laughing into the mic, lead singer Rishi Dhir responded "We've slept two hours since then." Yet, despite their lack of sleep, Elephant Stone milked their tiny, early afternoon, day one slot for all its worth. 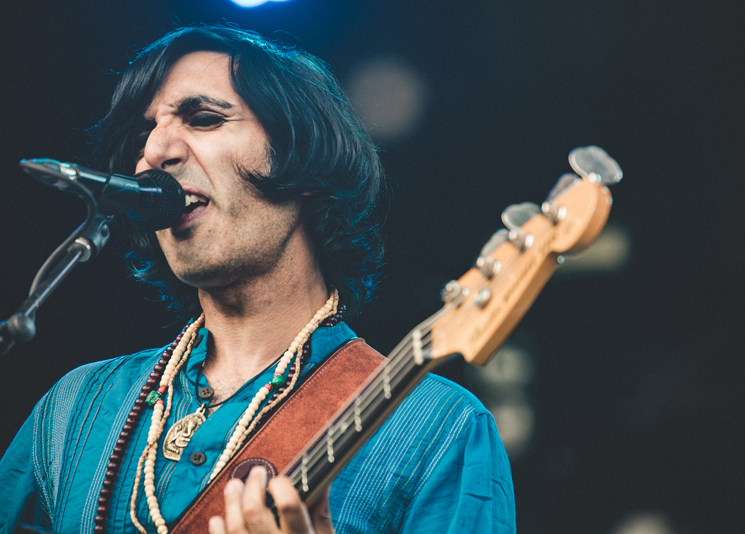 Armed with songs from their forthcoming album Ship of Fools, the band let their trademark blend of raga and psychedelic rock fill the valley with dissonance-heavy tracks that put the rest of the pop acts to shame. Harking back to the early days of Osheaga, when a hometown band like Elephant Stone would be headlining the festival, Dhir was all thank yous and charismatic winks, as the modestly-sized crowd cheered them on. Reserving heavier, sitar-involved tracks like "Don't You Know" for the last 15 minutes, Dhir and company allowed their normally seven-minute-long song to extend to a solid ten. Waving to a little girl with a blue butterfly painted on her forehead who was sitting on her dad's shoulders in the crowd before leaving the stage, Elephant Stone made sure that Osheaga was adequately pumped up for the rest of the day.